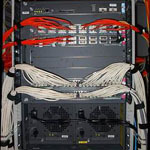 Pacific Internet operates out of two state-of-the-art facilities in the Seattle, Washington region and is ideally suited to handle colocation, disaster recovery, hosting, connectivity, and IT services for businesses of all sizes. Pacific Internet's datacenters are just 10 minutes South and 10 minutes North of the main metropolitan area of Seattle and within minutes of SeaTac International Airport and both main Highways I-5 and I-405. With easy access, free and ample parking, competitive pricing, and a fully scalable solution, packages can be assembled that will meet anyone’s demands. Our facility is efficiently controlled by a local, onsite, service-oriented staff that takes pride in the customer service they provide. All critical and non-critical facility and network equipment and systems are monitored 24/7 for a guaranteed uptime. Datacenter security is very important. All access into the Pacific Internet facilities are monitored and recorded. With a Biometric Entry system, there is a double layer of security which matches fingerprint to access card. If print does not match the card owner, access is denied and failed attempt notification is sent out. The facilities are constantly being monitored and recorded by numerous cameras. All movement within the datacenters is recorded and archived for several months. Pacific Internet facilities have a dedicated power feed, independent from the rest of the building. With multiple main power feeds into the business park, catastrophic power outages are greatly minimized. In the event of a power issue, Pacific Internet electrical systems are protected by fully scalable 3-phase UPS systems with automatic failover, checking and monitoring systems. In the event of a full power outage, automatic backup generator power is provided with 72+ hour runtime capabilities with refueling agreements in place. Pacific Internet's facilities have multiple fiber carriers into each facility. With multi-redundant 10g+ fiber connections for each facility, Pacific Internet's redundant fiber paths loop around Lake Washington providing regional redundancy also. With an all Cisco based redundant core GigaBit network, full BGP routing, multi-homed Tier 1 connections, full connectivity to the Westin POP meet-me-room and Seattle Internet Exchange (SIX) connection, Pacific Internet has a 99.99% network uptime guarantee. All flooring within Pacific Internet's datacenters are static resistant. This is very important for all sensitive electronic equipment. Pacific Internet's raised floor design boasts the industry’s best Zone 4 Seismically Braced flooring. This is very important within any of today’s datacenters and being demanded by those who need that added assurance. Also, with a raised floor design, all power and data cable management is protected under the floor. Multi-Redundant HVAC systems are the standard within all Pacific Internet datacenters. With over a ton of cooling capability per cabinet, there is ample cooling for the high demanding servers of today. Designed with the latest hot aisle/cold aisle containment approach, cooling and hot air evacuation enables Pacific Internet's datacenters to be more efficient and more accurate with their cooling demands while maintaining a consistent 67-70 degree ambient temperature. Fire suppression systems are very important in today’s datacenters. Pacific Internet datacenters have the latest FM-200 fire suppression systems. The systems are automatically triggered and fully monitored. These latest FM-200 fire suppression systems provide a much safer and cleaner environment and leave no residue, thereby eliminating costly after-fire clean-up, and keeping expensive "down-time" to a minimum.